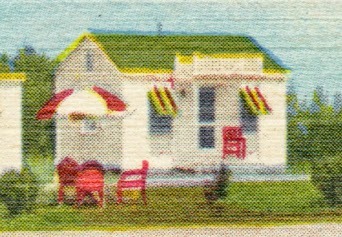 Countless American roadside motels came and went during the 20th century, fading quickly from memory and the landscape. But their advertising postcards remain, reminding us that they existed. 3½ Miles South of FARMVILLE, VA.
Farmville is a tiny town along Route 15 in Prince Edward County, Virginia. Rapper Lady of Rage (Robin Yvette Allen) and Vince Gilligan, the creator/writer of Breaking Bad, are among Farmville's former residents. U.S. Route 15 dates to 1926 and was one of the country's original highways. 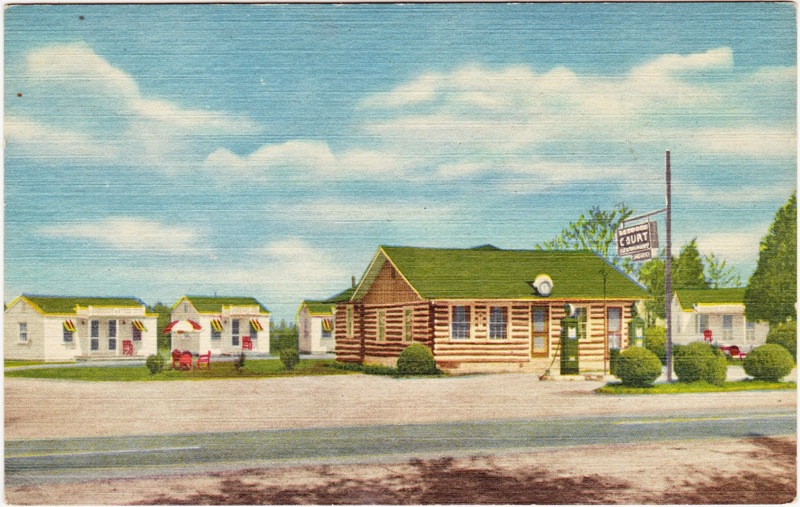 It runs from New York to South Carolina, and you can imagine why so many motels and restaurants must have sprung up along its path in the middle of the last century. The highway has changed a great deal over the decades and parts of it are now recognized as a National Scenic Byway. 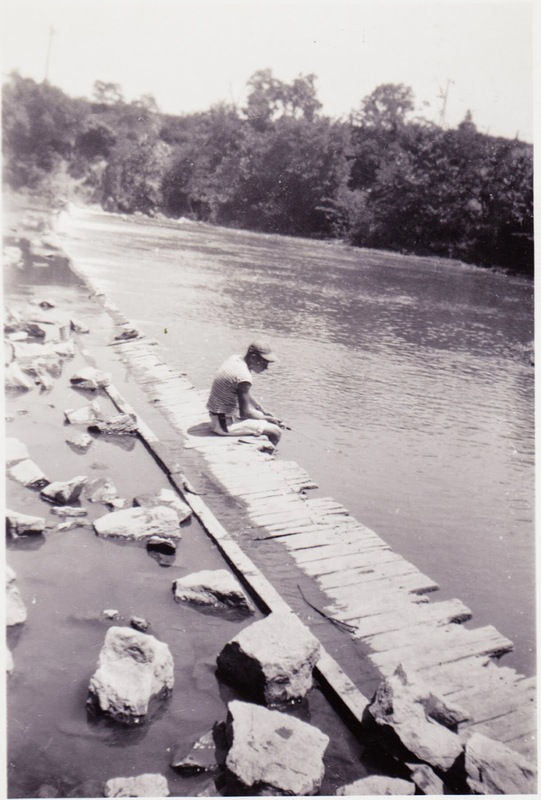 One book that documents its history is Along Virginia's Route 15 by Josie Ballato. 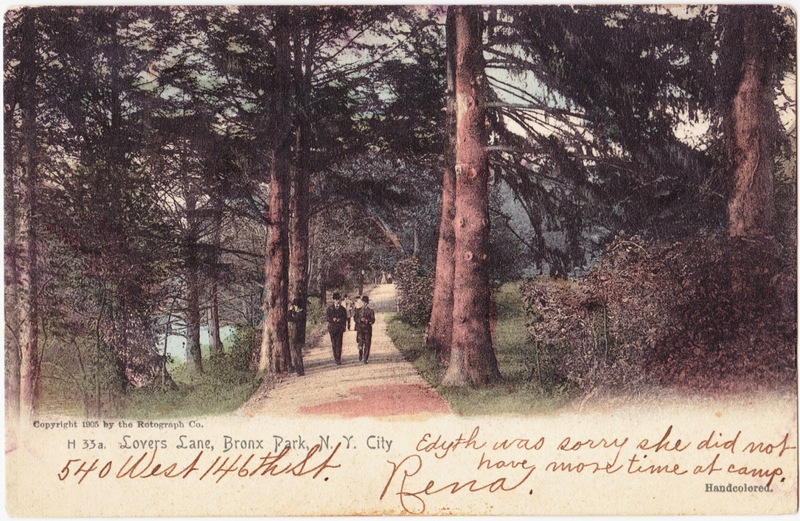 1906 postcard: "Lovers Lane, Bronx Park, N.Y. City"
Pictured on the hand-colored card1 is Lovers Lane at Bronx Park in New York City. The park dates to the late 19th century and is home to the New York Botanical Garden and the Bronx Zoo. 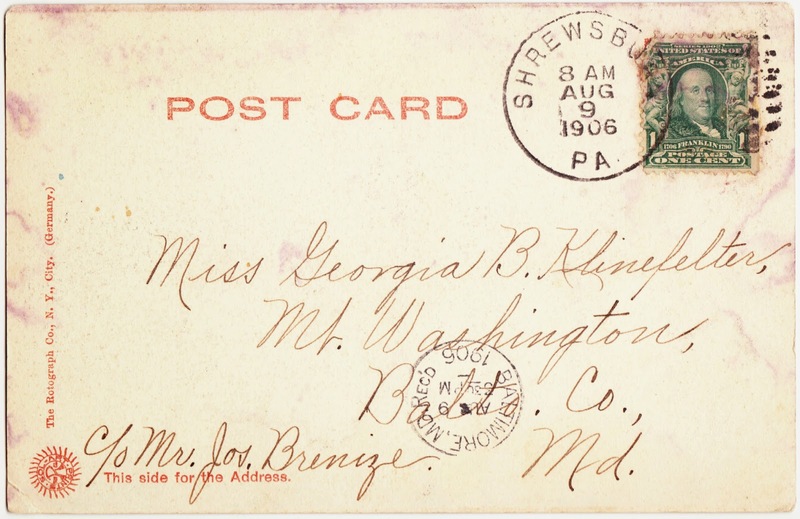 As this predates split-back postcards, the message is written on the front. It states: "Edyth was sorry she did not have more time at camp. Rena." There is also an address written on the front: 540 West 146th Street. That address, I believe, is now home to apartments in the Hamilton Heights section of Manhattan. 1. Kooky Kitsch has a copy of the black-and-white (uncolored) version of this postcard. What is the man on the left doing? "If a man make a better Mouse Trap than his neighbor, the World will build a beaten path to his Door though he build his House in the Woods!" "I trust a good deal to common fame, as we all must. If a man has good corn or wood, or boards, or pigs, to sell, or can make better chairs or knives, crucibles or church organs, than anybody else, you will find a broad hard-beaten road to his house, though it be in the woods." As you can see, Emerson's passage never even mentioned mousetraps! That might be because he died before what we know as the modern mousetrap was invented. "The Firm of Cook, Watkins & Co., 219-223 Columbus avenue, Boston, dates from 1891, at which time John F. Cook and George R. Watkins became associated in business under the firm name of Cook & Watkins, with offices at 120 Boylston street. 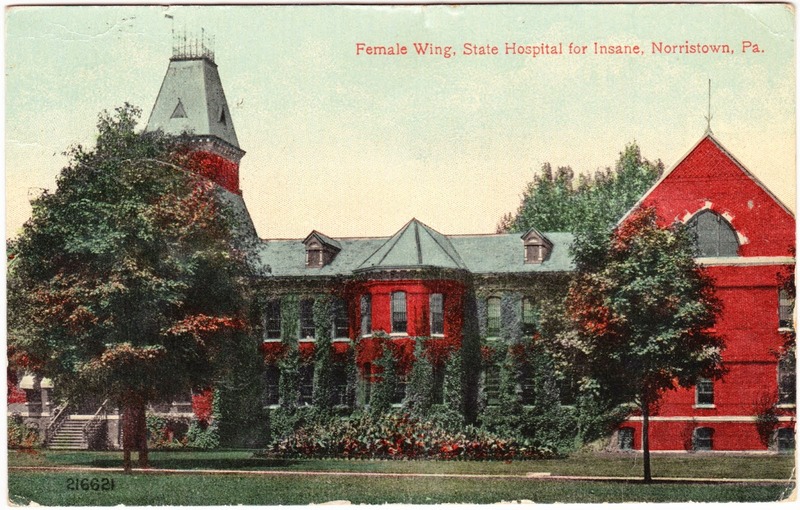 At the time they operated cutting plants at Quincy and Barre, with offices at Aberdeen, Scotland, and later controlled the output of the Pleasant River Quarries at Addison, Me. They now have a large wholesale business in Barre, Quincy, Westerly, and other New England granites and marble, and are large importers of Scotch and Swedish monuments and Italian marble statuary. Their monuments and statuary are sold to the trade all over the United States, they employing a large force of traveling salesmen for this purpose. 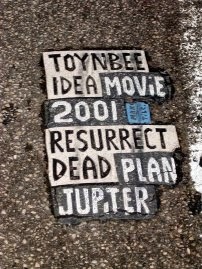 Their output is large, and includes everything in their line from the simplest markers to military and other public memorials. The soldiers' monuments at Morgantown, West Virginia, and Bar Harbor, Maine, are examples of their work in that line. "Mr. Watkins died in 1896, and Mr. Cook carried on the business under the same name, until 1907, when he retired from active business, and Bradford C. Patch took its management. 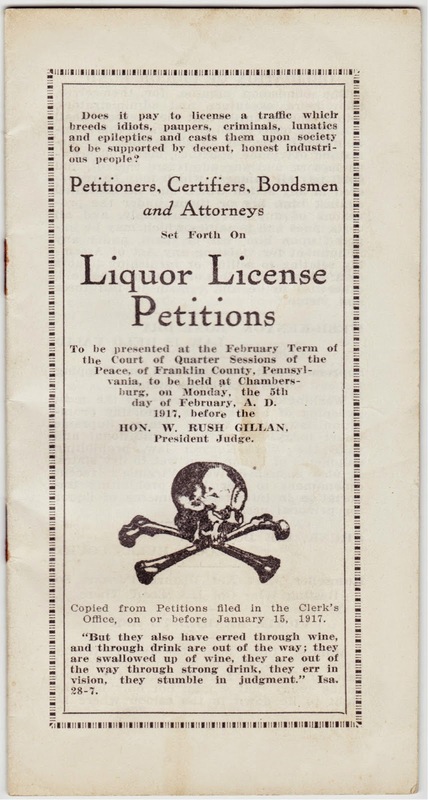 In 1910, Mr. Patch was admitted a partner, and the firm name changed to its present title." Current granite broker Cochran's Inc. states on its website that, in 1984, it "purchased several sections of the former Cook, Watkins and Patch granite plant for their new location." 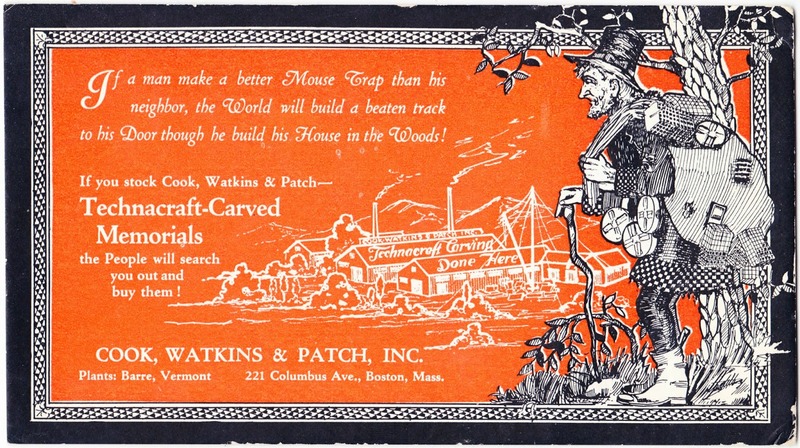 One of Cook, Watkins & Patch's longtime employees was designer G. William Patten (1907-1986), who began working with the company in 1924 and whose career is detailed in this post on the John J. Burns Library's Blog. While the company's memorials will last for centuries and centuries, I can't find very much online in terms of its ephemera. One AbeBooks dealer is offering for sale these items, which were once used by salesmen: "20 LARGE COLOR ILLUSTRATIONS OF TOMBSTONES OFFERED BY THE COOK WATKINS & PATCH, INC. ... Illustrations are 9 x 12 inches and are mounted on heavy cardboard stock 14 x 11 inches. Each illustration shows a single tombstone in a finely landscaped cemetary [sic]. 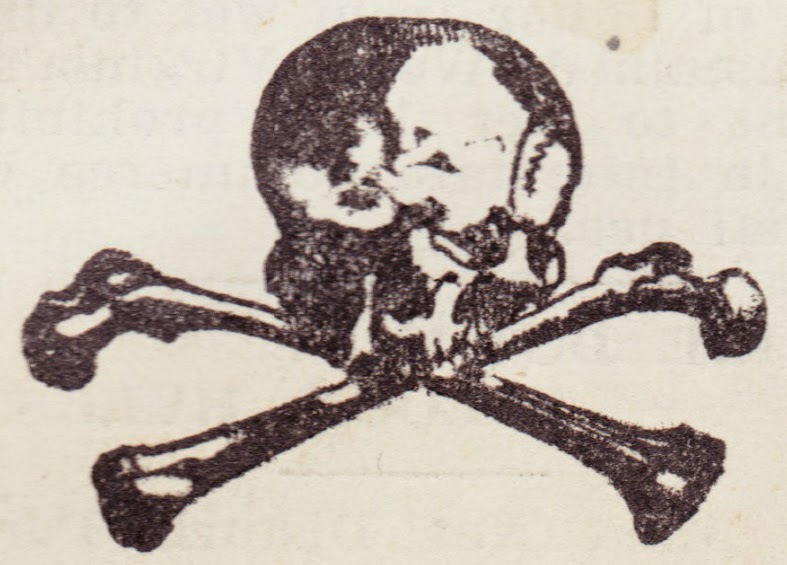 The Illustrations are individual and not bound together, as issued, and were used commercially to sell the tombstones." Vintage Ads and Books, meanwhile, offers one of the company's catalogs from 1931. It includes a photograph of the E.F. Albee Mausoleum at Kensico Cemetery in New York. 1. Some of the company's memorials were almost certainly made from Barre Granite, which I wrote about in this November 2012 post. Time for some milkman memories! Pictured below are three old milk-bottle caps. They're all of a smaller size — about 1½ inches wide. Now, I'm too wee young of a lad to remember milk bottles. So I'd love to hear people's memories on the topic. What are your memories of the milkman's daily deliveries? What were your favorite things to get other than milk? Were you or someone in your family's history a milkman? Are you a collector of milk bottles or milk-bottle caps? Comment at the bottom of today's post or email me at chrisottopa@gmail.com to share your stories. 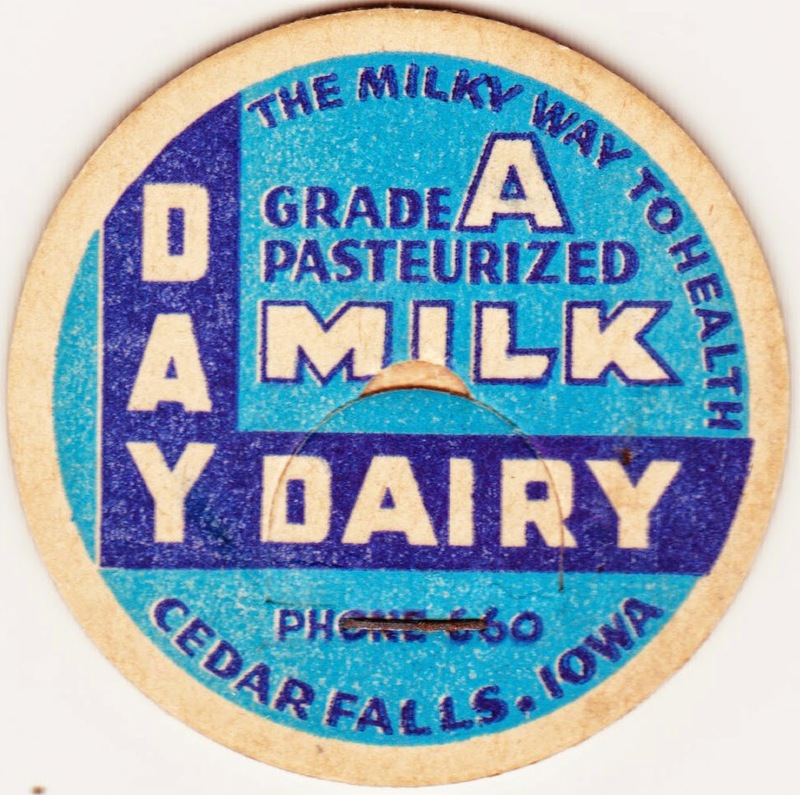 This first cap is from Day Dairy in Cedar Falls, Iowa. Its slogan was "The Milky Way to Health." 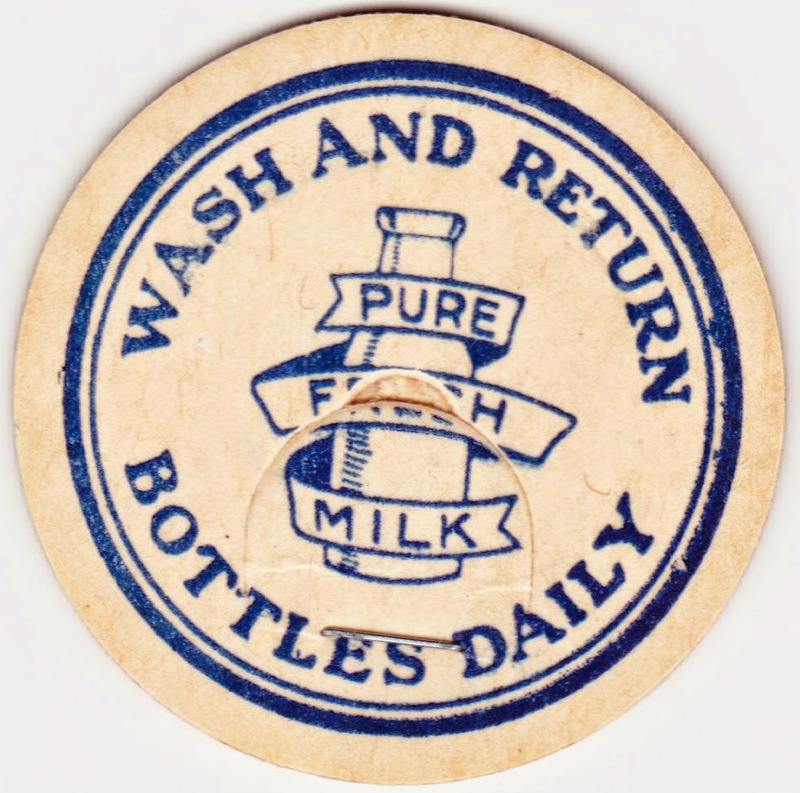 Up next is a generic milk cap that features a message encouraging customers to wash and return their empty bottles each day. 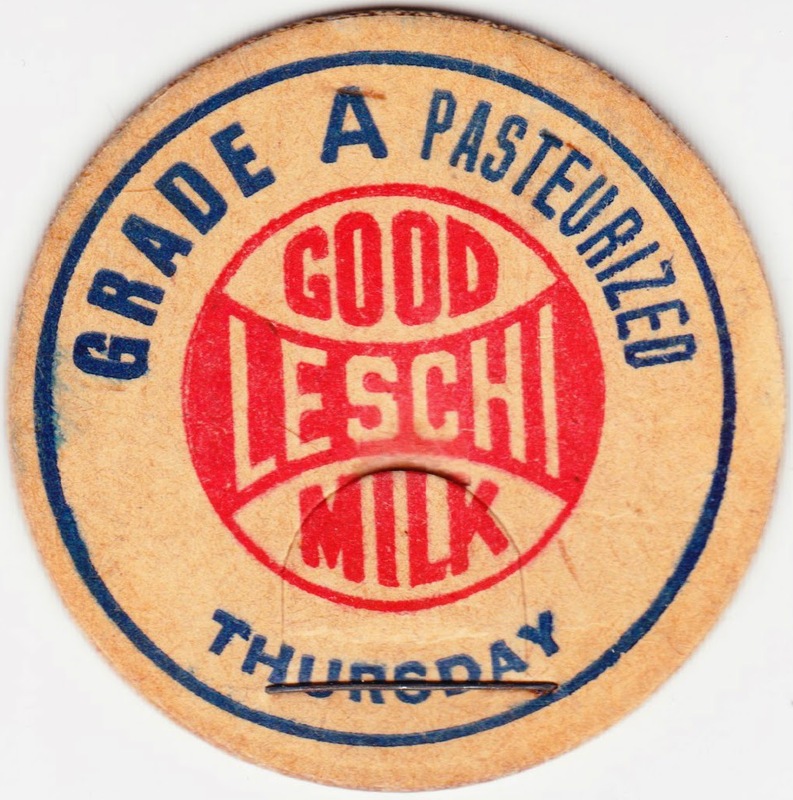 Finally, here's a cap for Good Leschi Milk. Note that the cap states "Thursday." I'm guessing there was a different cap for each day of the week, so that customers could keep track of which milk was the freshest. This photograph is stamped with a date of July 31, 1946, on the back.1 It also features the stamp of the James Lett Co., a long-closed photo supply business that was located in Lemoyne, Pennsylvania. So there's certainly a good chance that this picture was taken in this state. But who is the boy? 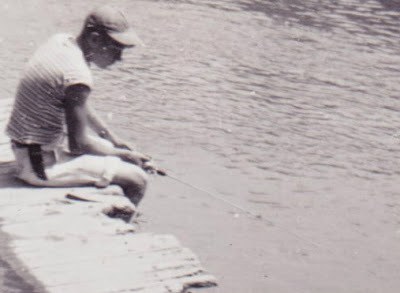 And where is he fishing? 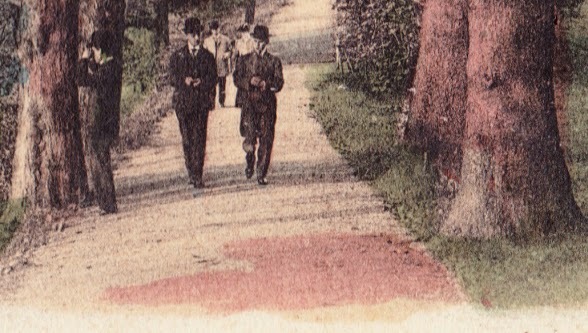 And another question — one we sometimes forget to ask with these mystery snapshots: Who took the photo? A friend? His father? A stranger? Regardless, the boy looks quite content and focused on his line. I fear that too many young people in this generation won't ever experience the peace, fresh air and opportunity for reflection that angling provides. 1. On that same day, in a very different part of the world, American cryptanalyst Meredith Gardner was, according to Wikipedia, "able to make the first breakthrough in a team project to crack the secret codes used by the Soviet Union in its espionage activities in the United States." It was part of the work done by the Venona project. Here's another small collection of international stamps that have come to my mailbox in recent weeks from Postcrossing exchanges. 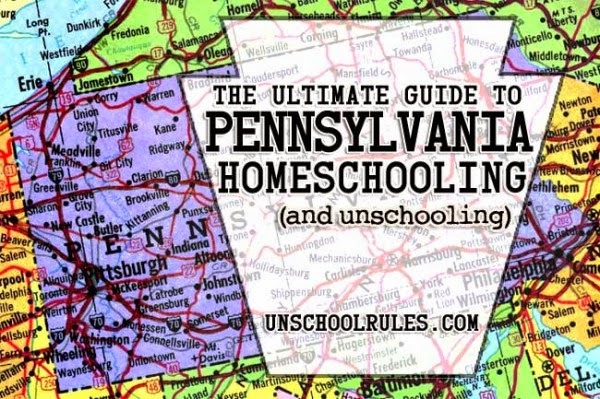 And there are some links at the bottom of the post if you want to see even more. "Scarves and shawls of Baranovs’ Troitsko-Alexandrovsky manufactory can be traced back to 1846. The main space in the products is occupied by multicolored floral patterns. Red, being present in every element of the pattern, unites centerpiece, hem and background. Geometric and oriental (‘cucumber’) motifs are present on the scarves along with the floral patterns." You can also see the other three stamps in this series on that Marka page. 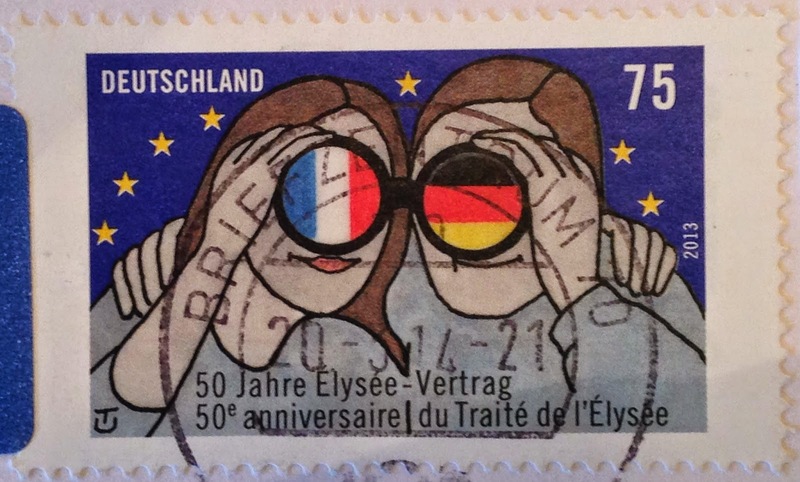 This stamp was issued jointly by Germany and France last year to commemorate the 50th anniversary of the signing of the Élysée Treaty between those two countries. There was also a commemorative coin issued jointly by the two countries. Read all about it in this news release. OK, I'd love to know more about this one. 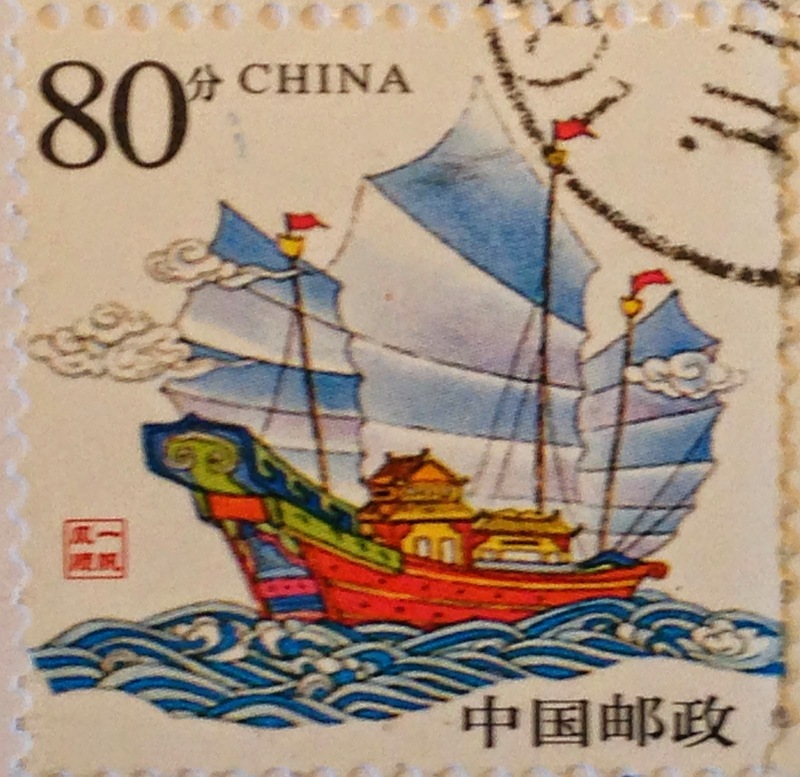 Can anyone help with translation and/or tell me what the significance is of this stamp, which features what appears to be a junk. 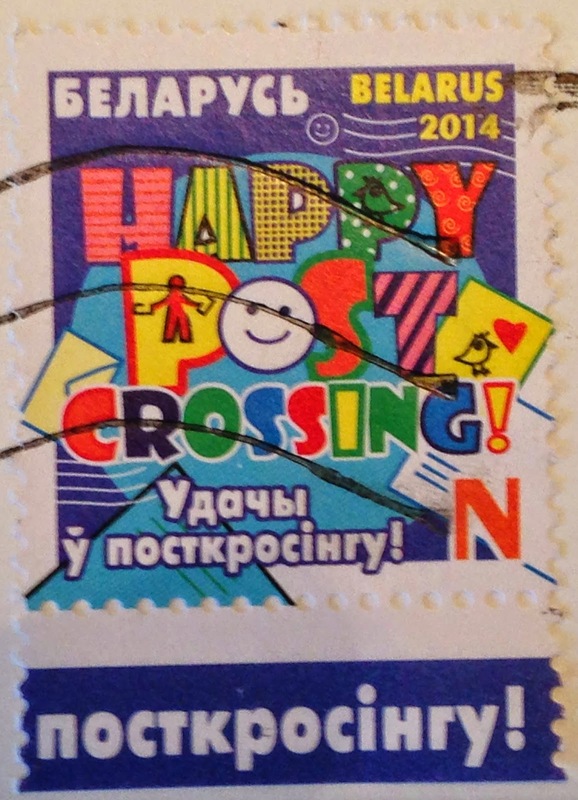 I think it's pretty cool that Belarus issued a stamp to celebrate the Postcrossing phenomenon. 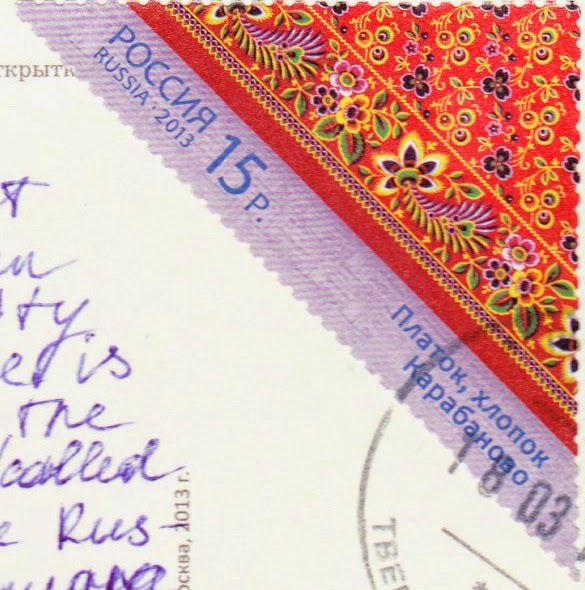 And it's even cooler that I got one in the mail, courtesy of Tanya in Minsk. We definitely need to get the U.S. Post Office to do one of these, too. 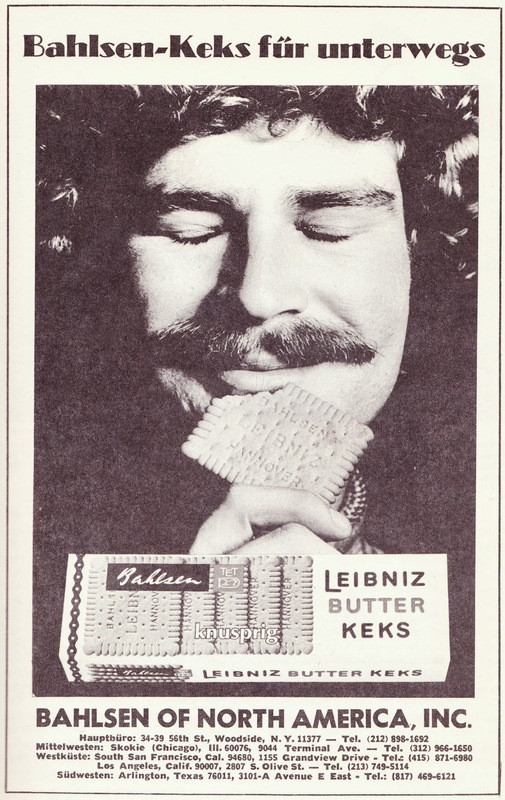 "Bahlsen biscuit for the road"
And that hair and mustache clearly translate to the 1970s. 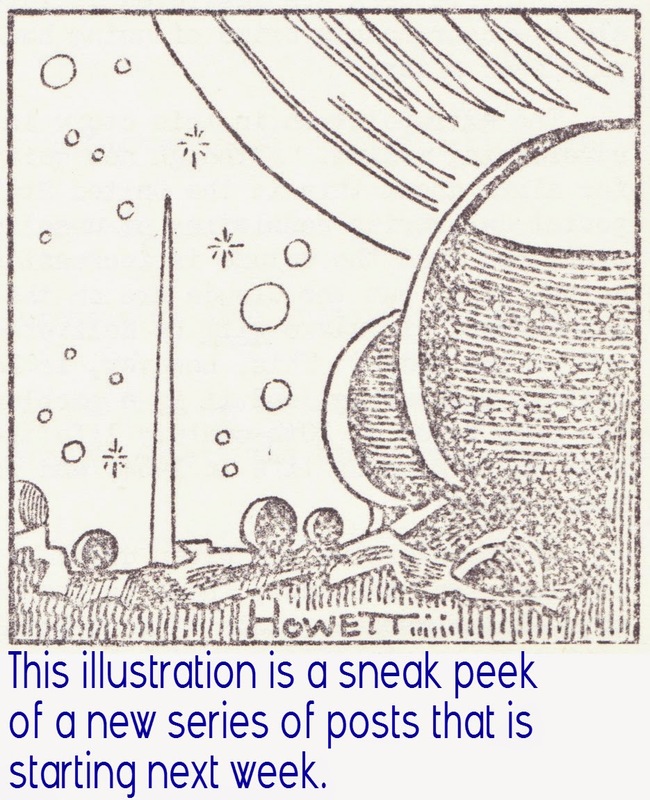 Indeed, this advertisement comes from an almanac that was published by Staats-Harold in 1976 to celebrate the German-American aspect of the bicentennial. The Staats-Harold is now known as the New Yorker Staats-Zeitung, which is one of the leading German-language newspapers in the United States. It dates to the 1830s. 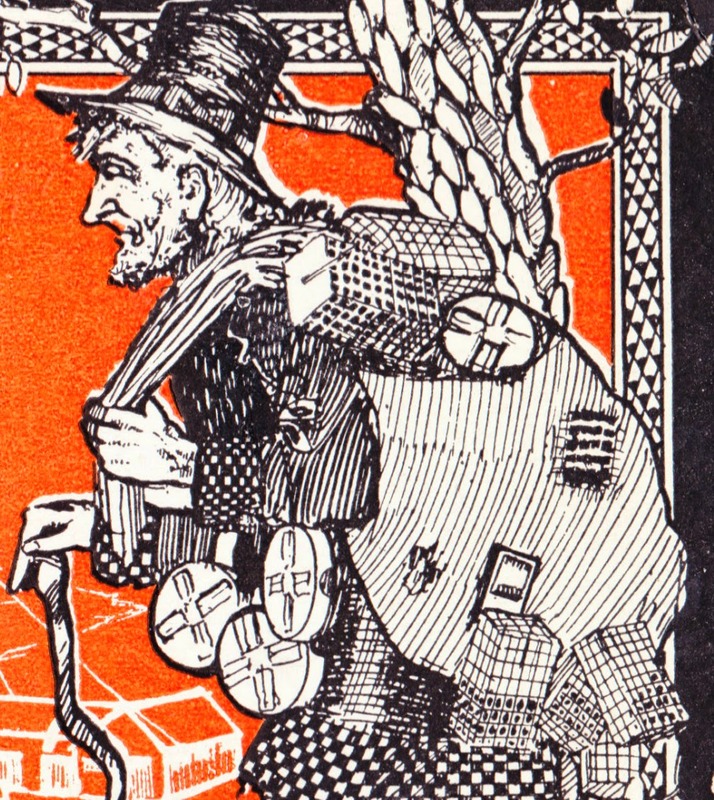 The almanac is filled with (mostly) German-language advertisements for pumpernickel, sausage, and numerous businesses and restaurants in New York City and the surrounding region. "After more than a century of tradition and family history, Bahlsen's original all-butter Leibniz biscuit is still the same simple pleasure it has always been: its charming shape, golden color and classic butter biscuit taste stand ready to enchant a new generation of biscuit lovers."